An earthquake is a combination of different phenomena. An earthquake initiates with the sudden slip of rock on either side of a crack in the earth, called a fault. The sliding of the rock on the fault due to the rock slip radiates seismic waves in all directions. The seismic waves vibrate the ground surface and are experienced as earthquake ground shaking. Different kinds of seismic waves travel with different speeds and have different amplitudes or strengths. For this reason, even though the rock slip that initiates an earthquake might be over in only a few or several seconds, the ground shaking radiated by a large earthquake slip on a fault can last many tens of seconds. The focus of an earthquake is the point where the rocks start to fracture. It is the origin of the earthquake. 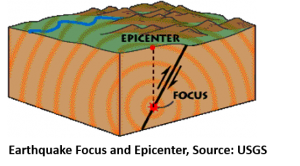 The epicenter is the point on land directly above the focus. The magnitude and intensity of an earthquake is measured by the Richter Scale and the Modified Mercalli Intensity (MMI) scale, respectively. The Richter Magnitude Scale measures the amount of seismic energy released by an earthquake, while the Mercalli scale describes the intensity of an earthquake based on its observed effects at a site where earthquake shaking is felt. The USGS generates a real-time map of earthquakes that have occurred over the past 7 days in the United States. The map includes the time and strength of any earthquake with a magnitude over 1.0 (updated hourly). All 50 States and the 4 US territories have had earthquakes in the past and will have earthquakes in the future. The USGS has characterized the Northeast US as a region of low to moderate earthquake hazard. If we look closer at the Northeast US and adjacent area earthquake epicenters over the past 40 years or so, we can see a significant number of recorded earthquakes ranging in magnitude up to 5.8. 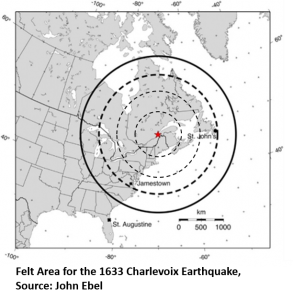 The area of the northeast U.S. and nearby Canada has always been earthquake country. The Native Americans of the region had many legends about earthquakes, and they had a word for earthquake (‘Naunaumemoauke’) in their language. The Pilgrims felt their first significant earthquake in 1638, only 18 years after the first landing at Plymouth, Massachusetts. As the European colonists multiplied and spread throughout the northeast, so did their experiences with earthquakes. Most of the earthquakes that they felt were small shakes, but some were stronger. And then there were some truly remarkable shocks. 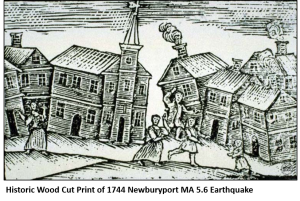 The shaking in 1638 was so strong that the residents of Plymouth had trouble standing without holding on to something. Today, seismologists think that this earthquake had a magnitude of about 6.5 and was centered in south-central New Hampshire. In 1663, an even stronger earthquake rocked the region. Its center was apparently in the Charlevoix region of Canada, where the earthquake caused major upheavals of the land. The earthquake of 1663 was strong enough to damage chimneys in Roxbury, Massachusetts, at a distance of about 400 miles from the fault. Dr. John Ebel of the Weston Observatory of Boston College rates this earthquake at moment magnitude 7.5, comparable to the largest of the earthquakes that took place in the New Madrid, Missouri seismic zone in 1811 and 1812. The latter generally are considered as the largest known earthquakes in eastern North America. 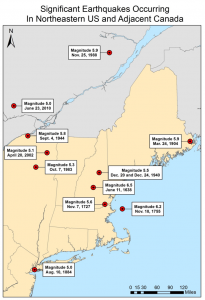 Colonial New England experienced some earthquakes that were strong enough to cause damage. 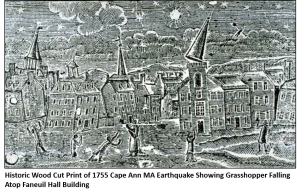 On October 29, 1727, an earthquake rattled the east coast from Maine to Pennsylvania. This was about a magnitude 5.6 shock that was centered in the area of Newburyport, MA. 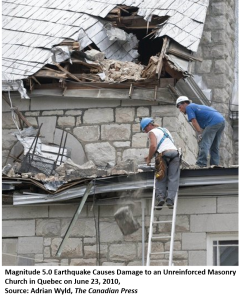 In northeastern Massachusetts and coastal New Hampshire many chimneys were damaged, some cellar walls caved in, and stone fences in the fields were thrown down by the earthquake shaking. In Newbury, MA and Hampton, NH liquefaction features called sand blows formed when the strong ground shaking ejected water and sand from the ground below, sometimes covering an area as large as 10 yards. Over 100 aftershocks were felt by the local residents of Newburyport during the months following the earthquake. Evidence of damage from the 1755 earthquake can still be seen today at the historic Weeks House in Greenland, New Hampshire. Damaging earthquakes in the Northeast have taken place event in modern times. In 1940, a pair of magnitude 5.0 earthquakes caused some damage in the Ossipee Mountains of New Hampshire. In 2002, a magnitude 5 earthquake damaged chimneys and collapsed some roadways in northern New York. In 2010, a magnitude 5.0 earthquake centered in Quebec damaged some buildings on Ottawa, Ontario, Canada. Since the 1970s, modern regional seismic network monitoring in the northeastern U.S. and southeastern Canada has been detecting earthquake activity on a regular basis. The regional network has detected all of the felt earthquakes, and in addition, it has detected many earthquakes that are too small to be felt. Several thousand earthquakes have been recorded in the region since the mid-1970s, with typically 10-20 new earthquakes taking place somewhere in the region each month. The map below shows the earthquake activity since 1975. Most of the major cities in the NESEC states have had one or more damaging earthquakes centered near them in historic times. There were damaging earthquakes near New York, NY (magnitude 5.0 in 1884), Boston, MA (magnitude 5.6 in 1727 and magnitude 6.2 in 1755), Buffalo, NY (magnitude 5.6 in 1929), and Hartford, CT (magnitude 5.0 in 1791). Earthquake activity that was not damaging and yet points to the local earthquake hazard has been recorded from near Philadelphia, PA, Rochester, NY, Syracuse, NY, Albany, NY and Providence, RI. Every city and town in northeastern North America has some measurable level of seismic hazard. The following table lists the number of felt earthquakes and the years in which damaging earthquakes have taken place in each NESEC state. Click On Your State Below for State-Specific Earthquake History, Information and Links. Mitigation is the cornerstone of emergency management. It is the ongoing effort to lessen the impact that disasters have on people and property. 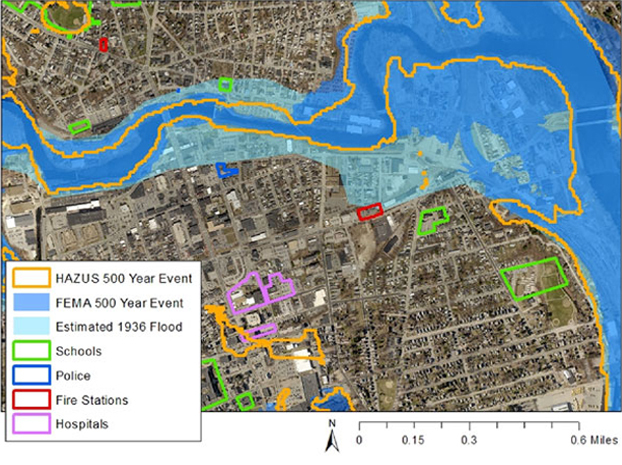 Mitigation involves keeping homes away from floodplains, engineering bridges to withstand earthquakes, creating and enforcing effective building codes to protect property from hurricanes — and more. Although the losses due to earthquakes varies from year to year, in the U.S. the average future earthquake loss is expected to average about $6.1 billion dollars per year, according to a recently released study by the Federal Emergency Management Agency (FEMA). The estimated future earthquake loss in the northeast is expected to average about $170 million dollars per year. A combination of the seismic hazard combined with the high seismic risk due the large number of major population centers in the northeast was used by FEMA to make this estimate. Seismic risk refers to the potential losses if earthquakes occur. Such losses include damage to buildings and other structures, loss of economic activity, injuries and deaths, and changes in the natural environment. Typically, buildings and other structures are at risk not only from earthquake shaking itself but also from other consequences of the occurrence of an earthquake, such as tsunamis, landslides, and land deformation due to faulting or liquefaction. Earthquake damage can lead to secondary risks, such as fires, loss of utilities such as power or water, and floods due to failures of dams or levee systems. Following a strong earthquake that causes significant damage there can be many other problems that must be managed. Persons displaced from their homes must be sheltered and fed. Medical aid must be provided to those injured by the earthquake. Earthquake rubble must be moved and disposed of so that emergency services can operate and damaged areas can be rebuilt. Earthquake hazard mitigation involves actions that are taken to reduce the potential losses due to future earthquakes. Some earthquake hazard mitigation measures are geared toward reducing the chances that buildings and other structures will be damaged by earthquakes. This is done primarily by developing, adopting, and enforcing building codes that contain provisions to strengthen the built environment to withstand earthquake shaking. Some earthquake hazard mitigation measures involve designing and constructing infrastructure systems, such as the electrical grid, so that they can remain operational following strong earthquakes. Other earthquake hazard mitigation measures include emergency planning for future damaging earthquakes and educating the general population about earthquake safety and earthquake preparedness. Your first line of protection against earthquakes is the strength of your home. The strength of your home depends largely on the contractor who built it and the building standards that the contractor used. Each state sets minimum quality standards, known as building codes, which contractors and builders must follow. For additional information about building codes in the Northeast States please click on the NESEC Building Code Report Image below. Below are the main categories of FEMA earthquake mitigation publications and tools. Practical guides and checklists describing how you can prepare your business to reduce the likelihood of damage or injuries during earthquakes and the risk of hardships and disruptions following disasters. Where is the fault that gives the earthquakes in the northeast? Because every earthquake occurs on a fault and because earthquakes are scattered throughout the region, there is no one fault on which the earthquakes take place. 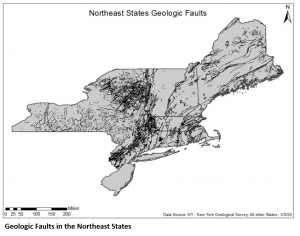 There are thousands of old geologic faults throughout the entire northeast, and so far seismologists have not accumulated enough earthquake data to show which of these faults may be active today. Many more years of earthquake data are needed before even the beginning of an answer to this question can be formed. The image below shows mapped fault lines in the Northeast, but their relation to past and future earthquakes remains unknown. Isn’t the earthquake hazard much lower in the northeast than in California? Doesn’t California have much stronger earthquakes than the northeast? 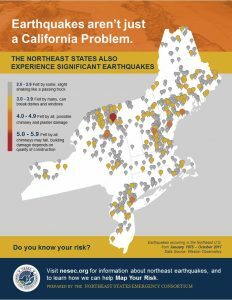 Earthquakes happen much more frequently in California than in the northeastern US, with the rate of earthquakes being about 100 times greater in California. Whereas a strongly damaging earthquake occurs in California on average once every 2-3 years, such an event occurs in the northeastern U.S. on average once every 200-300 years. On the other hand, the strongest known earthquake in New England, the 1638 earthquake in New Hampshire, probably was about the same size as the major earthquake that damaged the Los Angeles, CA area in 1994. The 1663 earthquake at Charlevoix, Quebec, just north of the northern tip of Maine, probably was just a little smaller than the size of the great 1906 San Francisco, CA earthquake. What causes earthquakes in the northeastern US? Earthquakes in eastern North America occur because of the pressure that builds up within the middle of the North American tectonic plate. 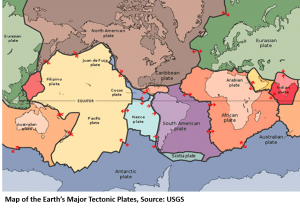 The North American plate is begin pushed away from the European plate and from the African plate at the Mid-Atlantic Ridge, which runs down the center of the Atlantic Ocean from near the North Pole to near Antarctica. At its western edge along the U.S. and Canadian west coasts, the North American plate is pushing against the Pacific Ocean plate and the Juan de Fuca Plate. Thus, the center of the North American plate is being very slowly squeezed from both sides. This squeezing builds up pressure within the plate center and that pressure eventually gets released in the earthquakes that are recorded and experienced. Our Northeast earthquakes are called intraplate earthquakes because they occur in the center of a plate away from the plate boundaries. As in all parts of the world, most of the earthquakes are of small magnitude and are not damaging. Only occasionally do damaging earthquakes take place. 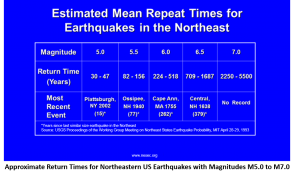 Why Does the Earth Quake in New England provides an excellent overview of why we have earthquakes in the Northeast. Do earthquakes in the northeastern U.S. have the same impact as they do in California? 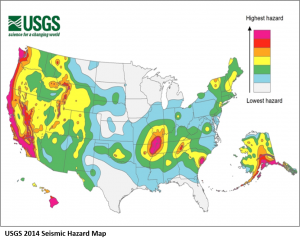 For an earthquake of a given magnitude, the strongest ground shaking if such an event occurs in California is comparable to the strongest ground shaking if such an event occurs in the northeastern U.S. Thus, the strongest ground shaking is similar if a magnitude 6.0 earthquake occurs in the northeastern U.S. or in California. However, the same magnitude earthquakes are felt over a much larger area in the eastern U.S. than in California. For example, a magnitude 6.0 earthquake is felt to a distance of about 300 miles from its epicenter in California, whereas in the northeastern U.S. a magnitude 6.0 earthquake would be felt more than 1000 miles from its epicenter. 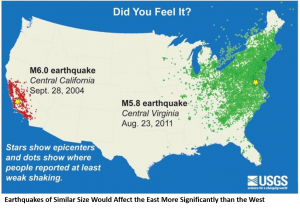 The Central Virginia M 5.8 Earthquake that occurred on August 23, 2011 illustrates how widely earthquakes are felt in the eastern US. This means that earthquakes in the northeast have a potential for causing damage at much greater distances from the epicenter than the same sized earthquake in California. When are earthquakes most likely to occur? Does the weather affect earthquake activity? Earthquakes seem to occur randomly over time. There is no season or time of day for earthquakes. They can occur at any time without warning. Because earthquakes originate in the rock miles below the earth’s surface, they are unaffected by the weather. Can scientists predict earthquakes? What warning signs precede earthquakes? So far, no scientific method has been found for earthquake prediction. Scientists have studied the dozens of damaging earthquakes that occur on earth each year, and so far they have failed to find any common pattern that precedes all or even many damaging earthquakes. This includes conventional studies of the patterns of the earthquakes, magnetic fields, electrical fields, ground deformations, gas emissions, and groundwater systems. This also includes less conventional studies, such as of animal behavior, atmospheric phenomena, and earthquakes in other parts of the world. Sometimes smaller earthquakes, called foreshocks, occur in the hours or days before a large earthquake and at the same epicenter as the large earthquake. Unfortunately, seismologists are unable to identify foreshocks when they occur, and so foreshocks are only recognized and named after the strong, main earthquake takes place. Nevertheless, the science of seismology seeks to understand what causes earthquakes by tracking their occurrence, measuring their force and using sophisticated imaging technology to probe the subsurface geology where they happen. While we still don’t fully understand how faults might control the location and timing of earthquakes, geophysicists and computer scientists like those at Los Alamos National Laboratory are using an array of new tools to study the interactions among earthquakes, precursor quakes (often very small earth movements) and faults. 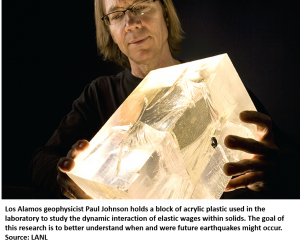 Ultimately, this may offer more clues to understanding future earthquakes and when and where they might occur. When is the next damaging earthquake expected in the northeastern US? Because earthquake prediction is not yet possible, it is unknown when the next damaging earthquake will take place in the northeastern U.S. However, the small earthquakes take place steadily from one year to the next, so there is a possibility that a damaging earthquake could occur at any time somewhere within the region. The last damaging earthquake in the region was a magnitude 5.0 event in April 2002 in northern New York State. The next damaging earthquake might not occur for many years, or it might occur tomorrow. 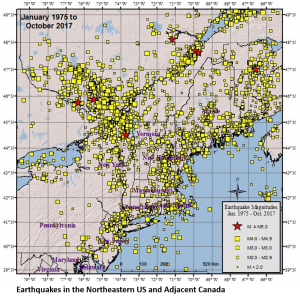 Based on the history of large earthquakes in the Northeast and the continued occurrence of smaller events scientists are able to estimate the average repeat times for earthquakes in the Northeast. While there is no way of knowing when or where the next large earthquake will take place, someday another damaging earthquake will occur in the region. 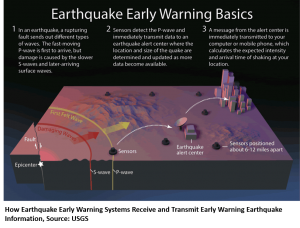 What is earthquake early warning? Is there an earthquake early warning system in the northeastern US? Because electronic communications is so much faster than the speed that seismic waves travel, it is possible for seismic instruments near the epicenter of an earthquake to send information about the occurrence of the earthquake to places at larger distances from the epicenter. Places that receive the early warning alert will have a time period ranging from a few seconds if they are relatively close to the epicenter to a few tens of seconds if they are far from the epicenter before they experience the shaking from the seismic waves. There is an operational early warning system throughout Japan, and Mexico City has an early warning system for strong earthquakes along its Pacific Coast. An early warning system in under development in California, although it is still in its test phase. Earthquake warning systems are very complicated and must be designed and built separately for each area on the earth. There is no earthquake early warning system in the northeastern U.S., and it will likely be decades before one is developed. What man-made structures in the northeastern U.S. are most at risk to earthquakes? Unreinforced masonry (URM) structures, such as buildings built of red brick or cinder block with no other means of support, are the most vulnerable when earthquake shaking takes place. The strongest shaking due to an earthquake is normally in the horizontal direction. Unreinforced masonry (URM) does not withstand horizontal shaking very well, and it tends to crack and fall apart in such shaking. Old unreinforced masonry buildings are often especially vulnerable to earthquake shaking because old mortar tends to be very brittle and break easily when shaken. In the 18th, 19th and 20th centuries many schools, factories, warehouses, fire stations and public buildings were constructed of unreinforced masonry and many of those buildings are still standing today in the cities and towns of the northeastern U.S. These buildings are at the greatest risk to sustaining substantial damage should a strong earthquake take place. Click here for more information on how to identify URM buildings. 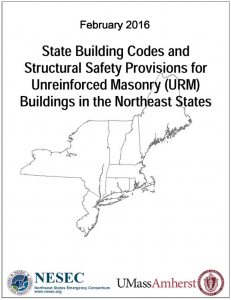 For additional information on state building codes for URM buildings, please click on this link to a report, State Building Codes and Structural Safety Provisions for URM Buildings in the Northeast States, prepared by NESEC in partnership with the University of Massachusetts at Amherst. Do all parts of a city or town experience the same level of ground shaking when an earthquake occurs? No. 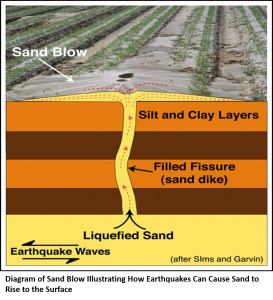 Soft soils, such as filled land and river sediments, tend to amplify some aspects of earthquake ground shaking compared to nearby sites that have bedrock or ledge at the surface. The thickness of the soft soils helps control which aspects of the ground shaking that is amplified. For example, soft soil that is 30 feet thick might amplify the aspect of the ground shaking that is most damaging to 1-2 story buildings. On the other hand, soft soil that is 200 feet to 300 feet thick might amplify the aspect of the ground shaking that is most damaging to buildings that are 5-20 stories high. For this reason, the amount of damage due to earthquake shaking in a city can vary significantly from block to block and from building to building. Scientists often create maps of urban areas that show where ground shaking amplification is most likely to take place, with each map showing the amplification factors that will affect buildings of different heights. For example, the City of Boston is situated on both bedrock and filled land, so an earthquake would affect these areas differently. The areas of filled land would be expected to experience stronger ground shaking and the potential for damage. 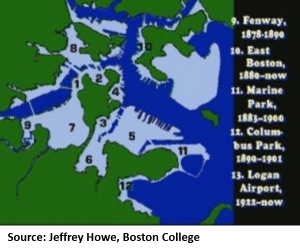 Click on the image below to watch an animated chronological timeline of when areas of in the city of Boston were filled. What will happen to my house if a strong earthquake strikes the northeast? Most houses in the northeastern U.S. are built of wood frame construction. Wood frame tends to be resistant to earthquake shaking without collapse unless there is some underlying problem. An underlying problem might be a weak foundation, damage due to rot or bugs, or improper design or modifications. Plaster walls and ceilings may crack due to earthquake shaking even if the structural integrity of the house is not affected by the earthquake. Windows can sometimes be broken by strong earthquake shaking. Houses that are not secured to their foundations may shift, causing structural problems that must be addressed. For most homes in the region, chimneys are made of brick or stone, and they are susceptible to damage in even moderate earthquake shaking. In fact, for many historic earthquakes in the region, the bulk of the significant damage has been to chimneys on homes and other buildings. Are any buildings in the northeast built to withstand earthquakes? 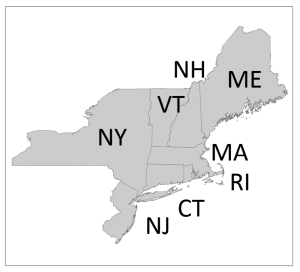 Most of the states in the Northeast have adopted some seismic provisions into the state or local building codes for certain types of new construction. The coverage, scope and enforcement of these codes vary by state and community. 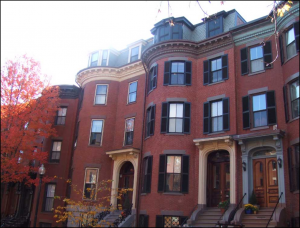 With some exceptions, older buildings in the Northeast are not required to meet the seismic safety provisions in the building codes. Thus, when a damaging earthquake strikes, it is the older buildings that tend to sustain the most damage. Fortunately, as time goes on the natural process of replacing buildings in our urban areas means that buildings that are not safe in earthquakes are normally replaced by earthquake-resistant structures. This means that our cities are gradually becoming more earthquake-resistant with time. What can the average person do to be safe if an earthquake suddenly starts? People are usually hurt in earthquakes by things falling on them. If outdoors, one should move into an open area away from buildings or other structures such telephone poles from which objects may break and fall off. If indoors, it is usually safest to stay indoors and to get under a sturdy piece of furniture such as a table or desk. If unable to do so, the rule of thumb is to “duck, cover and hold”. Running out of a building can be hazardous because objects may be falling off the outside of the building. 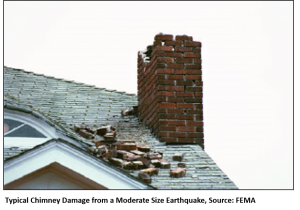 For example, bricks from the chimney on a house may fall off due to earthquake shaking and pose a hazard to anyone who is running out of the house during the earthquake. Click on the image below for an animation of how you can “drop, cover and hold on.” to help protect yourself in an earthquake. How can one prepare for earthquakes? Individual persons can do several things to ensure that they remain safe during and after an earthquake. First, everyone should know the fundamentals of personal safety when hazardous conditions arise. People should know how to find a safe place to protect themselves if an earthquake starts, and they should learn the drop-cover-and-hold on position. At home one should check the house for injury threats from earthquakes. For example, a bookshelf over a bed is a bad idea because strong earthquake shaking can hurl books off the shelf and onto the person in the bed below. Emergency escape routes should be kept clear. Working flashlights near beds are important for an earthquake that occurs at night. Each year the northeast participates in a Great Shakeout, where a day and time of a pretend earthquake are selected and people are encouraged to practice their earthquake safety procedures at that time. There are things people can do to prepare for the aftermath of a strong, damaging earthquake. 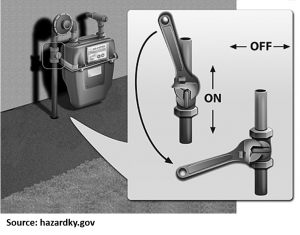 It is important to know how to turn off natural gas if there is a gas leak following an earthquake. If a gas leak is noticed, light switches cannot be used and matches should not lit until the gas line is turned off and the gas in the air has dissipated. Electricity is often lost during strong earthquakes, and so plans should be made to provide alternative light and heat sources following an earthquake. Emergency food and supplies should be kept on hand, and it is important to check them regularly to be sure they have not become out of date. Telephone communication systems often become overloaded following earthquakes, and so communications should be kept as brief as possible. Battery powered radios and smartphones are useful following an earthquake to get vital safety information following the event. Over the longer term, people should follow the seismic provisions in the building codes and ensure that new structures are built to those seismic provisions. Transportation systems, roadways, utilities and communications systems should be upgraded to minimize possible losses should a strong earthquake. For new construction, the added cost of seismic resistance is often only a small fraction of the total construction cost. For renewal of existing construction, earthquake resistance should be added whenever possible. Emergency planning is another important aspect of earthquake preparation. Government at all levels should have plans to deal with the occurrences of strong earthquakes, and those plans should be exercised regularly. Police, fire departments, and public works officials should be trained to respond to an earthquake emergency. Medical services and hospitals should have plans for responding to an earthquake emergency. For information, contact your local or state office of emergency management. Visit Ready.gov for more information on What to do Before, During, and After an Earthquake. Seismic hazards are the potentially dangerous consequences that are caused by the occurrences of earthquakes. When an earthquake occurs, a seismic hazard arises from the earthquake ground shaking and from faulting of the ground surface. Earthquake ground shaking can itself induce other secondary hazards, such as landslides, lateral spreading of soils, or ground liquefaction. Undersea earthquakes can also pose a tsunami hazard. Seismic hazard is always defined for a site, such as a property where a building is located. The seismic hazard is quantified by the level of ground shaking that a site would experience due to an earthquake. Because the strength of earthquake ground shaking at a site depends on both the magnitude of the earthquake and the distance of the site to the earthquake fault, different magnitude earthquakes at different distances from a site can have the same seismic hazard at the site. To account for all possible earthquakes at all possible distances that might affect a site, scientists can compute seismic a seismic hazard curve for a site. A seismic hazard curve is a plot of probability versus level of ground shaking that the site might experience during some time period (such as 50 years). Low levels of ground motion have high probabilities of being experienced, whereas high levels of ground motion have low probabilities of being experienced. The strength of the earthquake source that radiates the seismic waves is given a measurement called the earthquake magnitude. Dr. Charles Richter of Caltech devised the first earthquake magnitude scale, which is called the Richter scale. Today, seismologists report the strength of the earthquake source using the more accurate moment magnitude scale. Scientists also have a measure of the strength of the seismic waves at a site where earthquake shaking is felt. This measure is called the earthquake intensity. Today in North America, earthquake intensity is reported using the Modified Mercalli Intensity (MMI) scale. Every earthquake has only a single earthquake magnitude value but it has an entire map of intensity values, with the greatest intensities occurring near the earthquake fault and the intensity values decreasing with increasing distance away from the fault. An earthquake can cause damaging ground shaking when its magnitude is above about magnitude 5.0. By using the arrivals times of seismic waves at different seismic stations, seismologists are able to compute the precise point in the earth where the earthquake fault slip began. This point is called the earthquake hypocenter or earthquake focus. The point on the earth’s surface that is directly above the earthquake hypocenter is called the earthquake epicenter. For more definitions and terms, please see the USGS Earthquake Glossary.